In this Empire and Allies military unit guide we'll look at the units featured in the game. You have three main military structures the barracks, hanger and shipyard to build units from. Each of these structures has three upgrade levels. You’ll start by building the level one structures and then as you level up in the game construct the other buildings. The higher level troops require more cash and specialized resources which you can get from fighting NPCs, your Facebook friends, or by trading for them in your marketplace in exchange for game cash. The barracks is where you’ll construct your first units. Let’s look at each of the different unit types and how they can help your war efforts. Higher level units will have more hit points. Cadet Soldiers – Cost 100 coins – Good against airships, carriers, and artillery units. Cannon Artillery – Cost 200 coins – Good against tanks, battleships and bombers. Vintage Tanks – Cost 400 coins, 20 oil – Good against soldiers, gunboats, and fighters. Grunt Soldiers – Cost 800 coins, 40 oil 2 aluminum – Good against Artillery, carriers and airships. Field Artillery -Cost 100 coins 50 oil, 4 uranium – Good against tanks battleships, and bombers. Armored Tanks – Cost 1400 coins 70 oil, six iron – Good against soldiers, gunboats, and fighters. Plan to have at least two hangers to start6 and add more as you bring in more resources. Remember to build a nice mix of units to counter your Facebook friends and the NPC armies. Vintage Fighter – Cost 300 coins, 15 oil – Good against artillery, carriers, and airships. Zeppelin Airship – Cost 600 coins, 30 oil – Good against tanks, gunboats, and bombers. 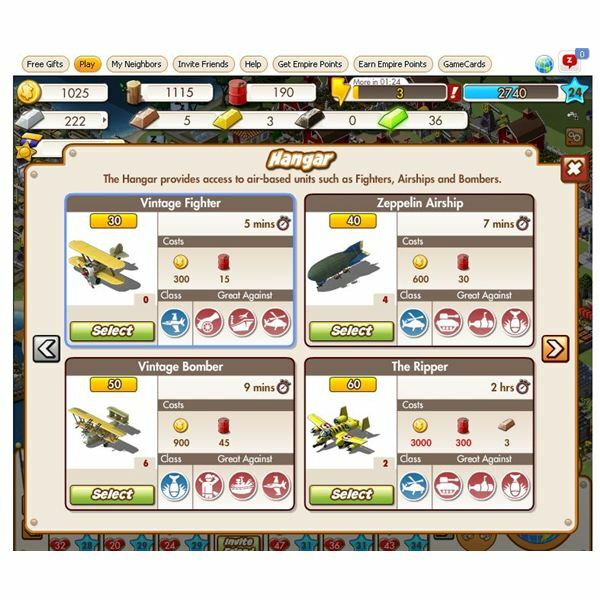 Vintage Bombers – Cost 800 coins, 45 oil – Good against soldiers, battleships, and fighters. The Ripper – Cost 300 coins,300 oil, 3 copper- Good against tanks, gunboats, and bombers. Mustang Fighter – Cost 1200 coins, 60 oil, 2 aluminum – Great against artillery, carriers, and airships. Light Airship – Cost 1500 coins, 75 oil, 4 gold – Good against tanks, gunboats, and bombers. Flying Fortress Bomber – Cost 1200 coins, 60 oil, 6 copper – Good against soldiers, battleships, and fighters. Build your shipyards on the coast and get a few expansions so you have room for extra shipyards. They take up quite a bit of room. Ironclad Gunboat – Cost 20 coins, 10 oil – Good against soldiers, carriers, and bombers. Vintage Carrier – Cost 400 coins, 20 oil – Good against artillery, battleships, and airships. Vintage Battleship – Cost 600 coins, 30 oil – Good against tanks, gunboats, and fighters. Torpedo Gunboat – Cost 1500 coins, 75 oil, 2 aluminum – Good against soldiers, carriers, and bombers. Light Carrier – Cost 1750 coins, 90 oil, 4 iron – Good against artillery, battleships, and airships. Light Battleship – Cost 2000 coins, 100 oil, 6 gold – Good Against tanks, gunboats, and fighters. The Butcher – Cost 2500 coins, 250 oil, 3 uranium – Good against tanks, gunboats, and fighters. It's up to you to decide which unjits you want to build in the game but you'll need all three for missions against the NPC armies. Get your economy running well and then start training units. Once units are finished building you can put them in your city or click the x icon on your interface and move them into storage. You can use any unit in storage during battles. Play the beginning NPC missions to gain valuable specialized resources such as copper, gold, iron, and uranium that you'll use to build the more advanced units. Strat by producing several solduer and artillery units and then follow the quests to produce the ships and aircraft units in the game. In future articles we'll look at the units for the level two and three structures in the game. Naturally these units will be more powerful but cost more coins, oil, and specilized resources. You'll build units such as bazooka soldiers, heavy artillery, and rocket soldiers. Level up in the game or progress throught the campaign to unlock the advanced units. Start with the levl two barracks which is the easiest to get to first. Upgrade your population levels to get these new buildings in your city. You won't go far with your unit building without a strong economy. You'll need dozens of farms and oil structures in the beginning and once you have a good economy you should move onto the higher level economic structures for increased output. You need farms to produce the bulk of your game coins and the oil wells for your oil production. Try to have plenty of Facebook friends since they can visit you and farm your resources for you so you don't waste valuable energy points collecting the resources. All images from Empires and Allies on Facebook. Source: Article is author's own experiences playing Empires and Allies on Facebook.